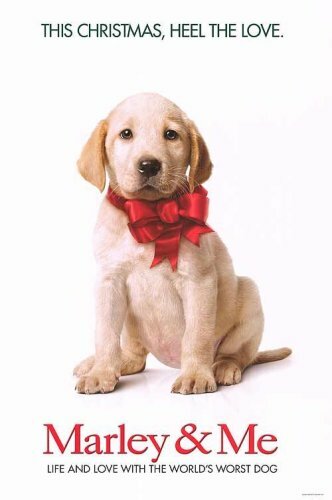 First, this is a min-review – I need to tell you right off the bat that we have not gone to see Marley and Me (although I have read the book), and I’m going to tell you why. Because Marley dies. He dies in the book, and he dies at the end the movie. It’s that simple. Yes, it’s the circle of life, and yes, all good things must come to an end, and all dogs go to heaven, or, at least, die. But if I wanted to take my son to a movie where he falls in love with the lead character only to have it die at the end… well, I wouldn’t. At least not in all its cinematic glory, on the big screen – no matter how tactfully it’s handled. There are other reasons, according to reliable reports, such as arguing between the couple, the couple trying to conceive (not on-screen, of course, but impliedly), but the main reason we will not go see it is because the dog dies. And that, primarily, is what concerned parents want to know about the movie Marley and Me. So now you know. He dies. that is good to know, as I’d have two broken hearted children for no other reason than entertainment. had a horrible surprise for my daughter 🙁 . . . we felt so terrible about that one. I am a mother of eight and I am so pleased to find a credible resource such as this on the frightening landscape of the internet. So far, I have not found a single movie that I find appropriate for my children to see. Even “Hotel for Dogs”, which your website has declared acceptable, is rendered inappropriate because of the poop references. Before I found this review, I took five of my children to see “Marley and Me”, and was horrified by the ending of the movie. Why anyone would make a movie about a dog that dies is beyond me. If only if I had found this review before, I would not have subjected my children (between the ages of 7 and 15) to such a movie! Luckily, my children are homeschooled and do not have to be subjected to this type of “entertainment” on a daily basis. I’m so glad I found this website so I won’t make the same mistake again. We were going to see Bedtime Stories, but thanks to your review, that movie is no longer on our list. However, even some of the movies you seem to find appropriate I believe are still not acceptable for children under the age of 15. I was hoping you could answer a question for me: At what age you would suggest children make their own decisions about which movies to watch? This has been a subject of tension between my husband and I.